I have only seen the White Lined Sphinx moth once in Minnesota. 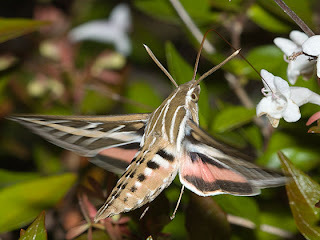 It is a very beautiful Sphinx moth with pink striped hind wings and distinguishing white stripes down the forewings and thorax. The caterpillar is brightly colored in black, yellow and green, with this combination of colors in varying degrees. 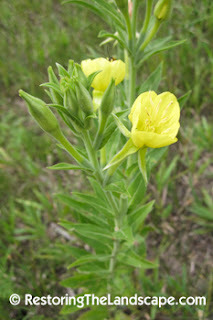 Common Evening Primrose is found in medium to dry soils in full to part sun. This plant was photographed on a short grass remnant where it grew to about 15 inches in height. 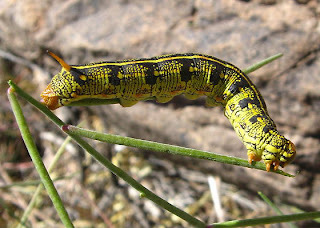 In richer soils, Evening Primrose can get much taller. The large four petaled yellow flowers emerge in mid to late July in Minnesota and can continue flowering into early September. 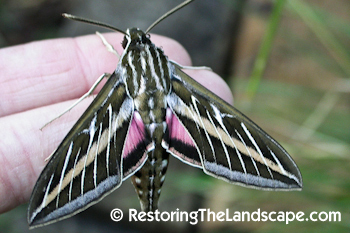 This plant can behave as both a biennial and perennial. Other Oenothera species in the upper Midwest are O. oakesiana, O. villosa, O. parviflora, O. perennis, O. rhombipetala and O. pilosella. Seeds for some of these species are available from Prairie Moon Nursery.